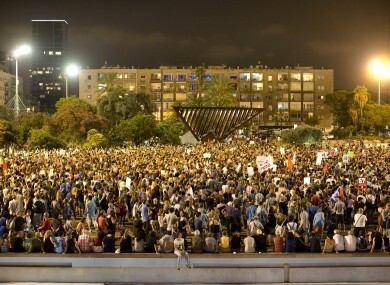 Israeli activists gather for pro-peace rally against a military solution to the Israeli Palestinian conflict in Tel Aviv, Israel on Saturday, 16 August 2014. THE ISRAELI MILITARY said it carried out a series of airstrikes today across the Gaza Strip in response to renewed rocket fire, a burst of violence that broke a temporary cease-fire and endangered negotiations in Egypt over ending the month-long war between Israel and Hamas. The fighting occurred some eight hours before a temporary truce was set to expire. Egypt had persuaded Israel and Egypt to extend the truce by 24 hours to give more times for the negotiations. While there were no injuries reported in Israel or Gaza, AFP reported seeing families fleeing their homes, carrying bags of clothes, pillows and mattresses. In the latest reports, the chief Palestinian negotiator conducting indirect talks with Israel for a long-term truce said there had been “no progress,” with less than five hours to go before a temporary ceasefire expires. “This rocket attack on Beersheba is a grave and direction violation of the cease-fire,” Israeli government spokesman Mark Regev said. The Israeli military said Gaza militants fired three rockets into Israel that landed in open areas near the southern city of Beersheba. Hamas police officials said seven Israeli airstrikes targeted open areas. Within minutes, it said it carried out a series of airstrikes. It accused militants of violating the cease-fire and said it maintains “both defence and striking capabilities in order to address the renewed aggression”. The rocket fire broke a nearly weeklong lull that has held during the Egyptian-mediated negotiations. Earlier today, Palestinian and Israeli negotiators had resumed their indirect talks after agreeing to the 24-hour extension. Hamas is seeking an end to a seven-year Israeli-Egypt blockade that has ravaged Gaza’s economy. Israel wants Hamas to disarm. An Egyptian compromise proposal calls for easing the blockade, but not lifting it. And while Hamas would not be required to give up its arsenal, the Egyptian plan would give Western-backed President Mahmoud Abbas, whose forces were ousted by Hamas in 2007, a foothold back in Gaza, running border crossings and overseeing internationally-backed reconstruction. In an apparent attempt to pressure Hamas, Egypt said early Monday it would co-host an international fundraising conference for Gaza - but only if a deal is reached first. That appears to play into the hands of the Abbas’ Palestinian Authority, which is eager to regain control of Gaza. The Palestinian official also told the AP that Israel wants to put off for an unspecified date any discussion on the opening of a Gaza seaport and airport and the release of Palestinian prisoners held in Israeli jails. The Palestinians, however, say they will only agree to postpone discussing the seaport and airport for “a month after a cease-fire agreement, with other issues like…. the prisoners,” the official said. He spoke condition of anonymity because he was not authorized to discuss negotiations with journalists. He also said that Israel agrees to extend the maritime territory in which Gaza fisherman can venture out from two to 4km and eventually to 19km from the shore, but that it was standing firm against Hamas’ demand for unsupervised exports from the strip. Jamal Shobaky, the Palestinian ambassador in Cairo voiced disappointment with the Israeli stance, particularly on the question of the blockade. “What the Israelis have offered so far in the talks is not removing the blockade but rather easing it,” he said. “Following renewed rocket attacks… the IDF is currently targeting terror sites across the Gaza Strip,” an army statement said. An foreign ministry statement described the volley as a violation of the ceasefire agreement which is due to expire at 9pm GMT today with Israeli and Palestinian negotiators in Cairo working against the clock to reach a deal to secure a longer-term truce in Gaza. An Israeli government official official said that truce negotiators have been ordered back from Cairo. Email “Palestinians flee homes with bags of clothes and mattresses as Israel raids start over”. Feedback on “Palestinians flee homes with bags of clothes and mattresses as Israel raids start over”.